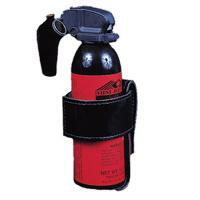 Stallion Leather MK-9 Reinforced Pepper Spray Holder is the S.W.A.T. team's choice for chemical agent carriage in those tense situations that have become all-too familiar. Stallion's MK-9 spray case features the strength of Velcro-closure to securely fasten in the MK-9 while allowing easy access in dangerous situations. The Stallion utilizes a shelf designed for optimum support of the spray. This reinforced carrier has been created as an accessory to the 2.25 inch duty belt thus allowing for its use by prison guards and in crowd control situations.